That could just sum up my whole review of the concert. It's hard to put into words how incredible these two performers are, but it's not surprising when you look at the catalogue of work that each one has built up over the last few decades in musical theatre. Also, no shock that the first half was full of songs from the shows including Blood Brothers, Sweeny Todd and West Side Story. 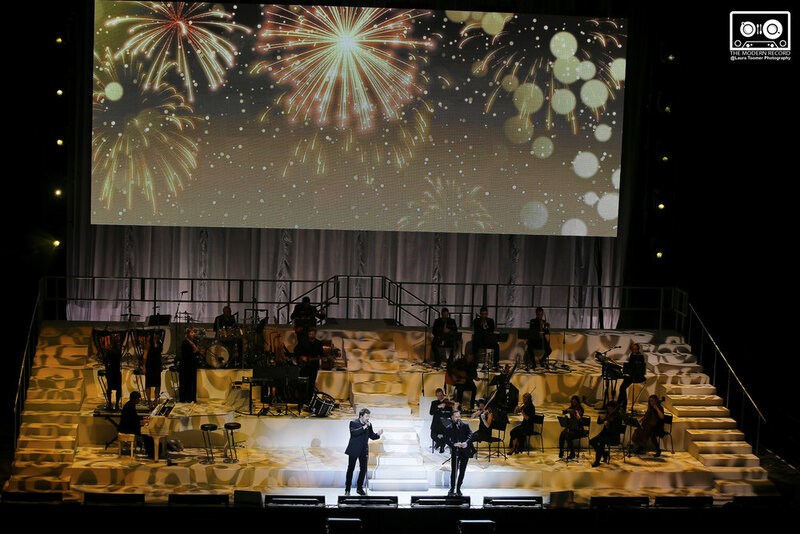 With a wonderful 15-piece band and 3 backing singers joining them on stage, it was a magical evening taking the audience on a journey that covered a whole range of musical styles. 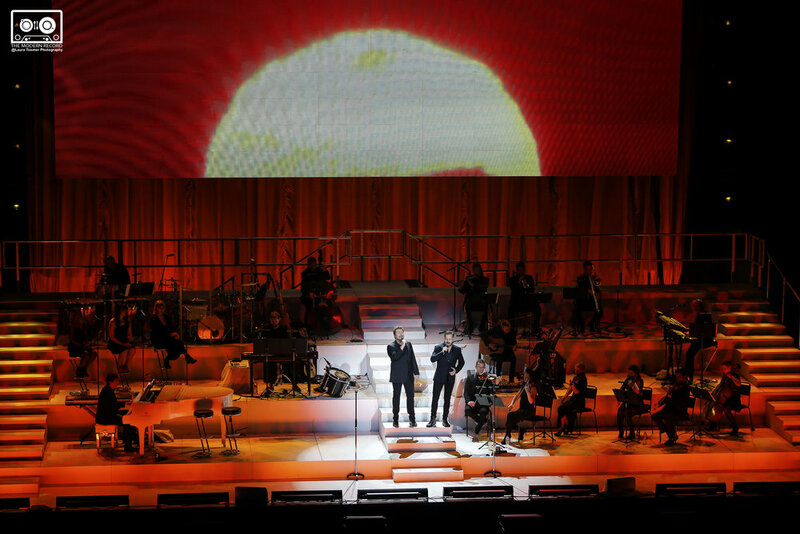 One of the more upbeat songs of the first half "Higher and Higher" saw a sprightly Alfie Boe shimmying across the stage, not to be out done, Michael Ball followed suit much to the adoration of the fans. 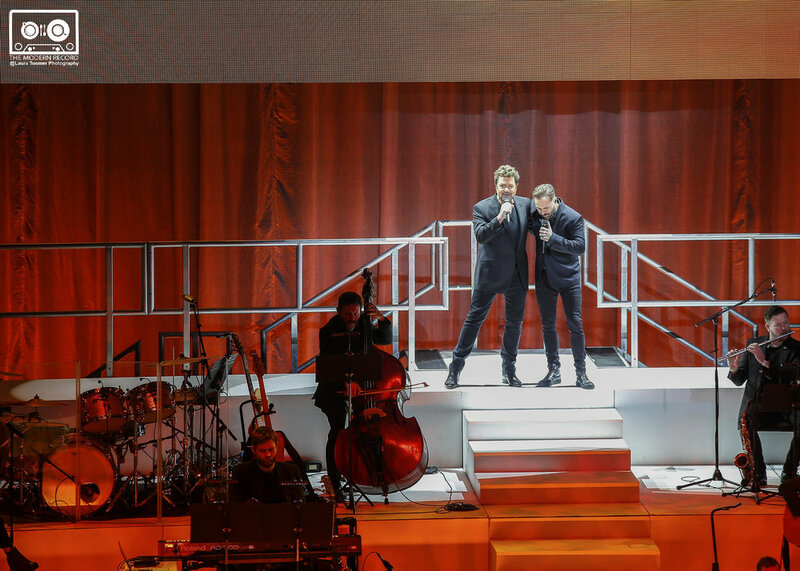 The 1st half continued to build with "One Thousand Years" a fan favourite from their first album "Together" and a duet of "Love Changes Everything" from "Aspects of Love" which is one of the songs most linked with Michael Ball's career. The stand out song from the first half was "He lives in you" from Lion King which is a beautiful and powerful song suiting both singers gentle but powerful voices. Ball and Boe left the stage of the first half to a standing ovation. The second half definitely stepped up a gear and the momentum spiralled. Ball and Boe are a fantastic comedy duo, Ball playing the cheeky guy next door and Boe playing the grumpy one..... but it is easy to see that really, they are both the kind, friendly guys having a lot of fun on tour with their friend. Singing the iconic song "Bring me sunshine" that they recently closed the Royal Variety Performance with was lots of fun to watch. Look out for the single being released on December 15th with an array or stars collaborating on it for charity. The first unexpected highlight of the second half was the fantastic Queen medley, it was clear that this had come from Boe. watching him rock out on stage and jump in the air showed he was finally getting the chance to live out a boyhood dream. Then we had the opportunity to see the singers perform some solo songs. Michael Ball sang "You can't stop the beat" a song from the musical "Hairspray" which he starred in London and then took on tour 10 years ago. He then sang the beautiful "Impossible Dream" that he asked the audience to really listen to the lyrics and think about all the good people in this country who have walked into the dangerous situations to save others. It was a special moment in the night as he spoke about Manchester Arena and how shocking the good of people shone through. This ended his solo section with the audience in tears and on their feet cheering. Michael Ball is and always will be one of the best stage performers of his generation. Next it was the turn of Alfie Boe, he came out with a guitar over his shoulder and looking very different to how we normally see him. He looked nervous. The nerves melted away as he sang a country song and wowed the audience with how different his voice sounded singing such a different genre of music. Boe really showed a different side during his solo time. His second song was "Run" by "Snow Patrol" and he took the rock star vibe to a whole other level by jumping down into the crowd and making his way around the venue singing to the audience, shaking their hands and really loving his new-found freedom. The next standing ovation came from the medley of songs from "Les Misérables" a musical that both Ball and Boe have become well known for their roles in. "One Day More" was a spectacular performance showing how incredibly talented singers, actors and all-round performers Ball and Boe are. It brought the audience to their feet and ready to march! I would talk about the encore but it was so good and such a surprise that I wouldn’t want to spoil it for anyone who hasn’t seen the show yet. Get to a show and be amazed and dazzled by two men who deserve their crowns as kings of the musicals.